Occasionally, a friend or neighbor will ask me about the Libertarian position on this or that controversy. The question might be, “What will Libertarians do for the poor?” or “Why don’t Libertarians like the Fed?” I tried to address many of these issues as a candidate back in 2010 and 2012, in a series of campaign essays that I eventually collected and published in book form. 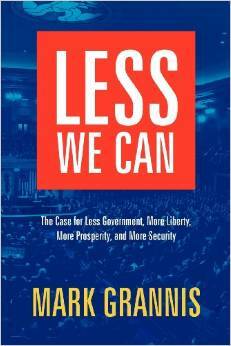 The book was (and is) “Less We Can: The Case for Less Government, More Liberty, More Prosperity, and More Security” (2012). Here’s an excerpt that I’ve found to be foundational to many other answers. For example, before we can really understand all that liberty can do for the poor, we need to understand what liberty can do to make sure we have fewer poor people to begin with. So without further ado, this is . . . Most people in the United States take for granted that free-market economies “work” better than centrally planned economies. That is, almost everyone in any domestic political debate will agree, without thinking about it much, that placing the government in charge of how many shoes get made, and what the price of corn should be, and where we all work, would be disastrous for everyone. We’ve seen other countries try it, and we know it doesn’t work. It’s good that we don’t have to argue about this. But an unfortunate side-effect of not arguing is that many voters don’t really understand why free-market economies are more prosperous, or why government interference usually makes us poorer even when it falls well short of total centralization. And that makes these voters suckers for politicians who promise to “improve” unpopular economic outcomes like high gas prices or electricity brownouts. So let’s look in very basic terms at how liberty creates prosperity. Economic reporting often focuses on arcane aggregate statistic of dubious reliability and uncertain meaning, so I think it’s important to emphasize that economics is about how to solve the very real and very human problem of how to feed, clothe, and shelter ourselves. Humans have material needs, as well as a natural drive to satisfy those needs. We also have a natural inclination to satisfy our needs with as little effort as possible. The overriding goal of all economic activity is really only this: to satisfy human needs as abundantly as possible with the minimum amount of work. One of the principal ways we generate abundance is by trading with each other. Why? Because we don’t all have the same skills or aptitudes, and once we get beyond the most basic necessities we don’t all have the same tastes and desires either. Trading allows us to specialize; to focus our work on what we like and what we’re good at, and trade for the other stuff we need. If one neighbor just builds houses and the other just grows food, both families end up warmer and better fed. That’s why most of us are better off buying hamburger from the butcher instead of raising our own steer. It’s also why it’s a mistake to think of free markets as essentially “selfish.” One of the miracles of the free market is that it facilitates very sophisticated forms of social cooperation among people who aren’t getting explicit directions from anyone and who may not even know of each other’s existence. In theory, people could trade without ever using money. The wheat farmer could pay the blacksmith in wheat, and the carpenter could demand fish for building the fisherman’s house. But money makes trades much easier. Money allows fishermen to buy houses even from carpenters who hate fish, and it allows farmers to sell wheat to blacksmiths and carpenters and fishermen alike without calculating separate rates of exchange with each. Instead, people with goods or services to sell can reduce their terms of exchange to a single price in money. That’s true whether the money in question is paper, gold, stones, or wampum. When we’re allowed to engage in purely voluntary trades with each other, something fascinating happens. We benefit not only from the exchanges themselves, but from the price signals that emerge from those exchanges. The prices allow us to fine-tune the relative amounts of work we put into buying and selling different goods and services. When the price of potatoes rises, people with the ability to produce potatoes try to supply more of them and people who eat potatoes try to eat fewer. Not everyone will become a potato grower, and not everyone will stop eating potatoes, but some people will act on the signals sent by the rising price, and that will tend to counteract the price increase and bring demand and supply back into balance. It is this highly decentralized process of continuous adjustment that in fact guides consumption, production, and investment in free economies. Our ancestors learned to work, to trade, to use money, and to respond to price signals, all without government direction. In fact, anthropologists have evidence that we were engaged in trade (and the specialization of labor) as long as 100,000 years ago, long before we had anything like the modern state. Government can help, to be sure: by clearly defining property rights, and by protecting people from violence, theft, fraud, and broken promises. But unfortunately, modern governments often want to do more. When the price signals from free trade deliver bad news (e.g., we have too many houses and not enough oil), politicians motivated by personal ambition have an incentive to try to “help” us by “correcting” unpleasant market outcomes. Fortunately, we can now see at least some of the ways government interference makes us worse off. First, government makes us worse off by compelling or prohibiting voluntary trades. If Jones would like to trade some of his fish for some of Smith’s wheat, and Smith is equally willing, we can be sure that the trade makes both Smith and Jones better off (by their own lights, at least). That’s not true if Jones is forced to sell fish or Smith is forced to sell wheat (or if either is forced to buy health insurance). Indeed, a forced exchange of wheat for fish almost certainly makes either Smith or Jones worse off, because if the trade were mutually advantageous there would be no need to force the two sides into it. And government usually makes both Smith and Jones worse off when it prohibits them from trading even though they would prefer to do so. Second, government makes almost everyone worse off when it fiddles with prices, because that distorts our allocation of society’s resources. We may not like high gas prices, but they tell us something important about gasoline, namely that it is getting scarcer and that we would be well advised to take actions that increase production, reduce consumption, or both. Capping prices would hurt us twice, by failing to stimulate additional supply, and by failing to moderate our demand. We’d get cheap gas, but less of it, and long lines for whatever we got. In the wake of an economic dislocation like our current Debt-pression, many people want desperately to believe that government can solve the problem and keep it from happening again. It never works out that way, and by now we ought to know why. Making the right economic decision in any particular situation—that is, the decision that satisfies human need as abundantly as possible at the lowest cost—requires detailed knowledge of all the relevant considerations, and that knowledge cannot be centralized. No one knows how many loans banks should make or how many homes people should buy. It’s not just that such knowledge doesn’t exist in Washington; it’s that such knowledge doesn’t exist anywhere. We ought to stick with what works: liberty. Author: Mark Grannis. This entry was posted in Opinion and tagged economics, free markets, free trade, Less We Can, Mark Grannis, Prosperity.